Recently we have made a collection dedicated to food-inspired website designs that replete with stunning color schemes, massive use of textures and patterns, well-thought typography treatments, and, of course, mouthwatering images. 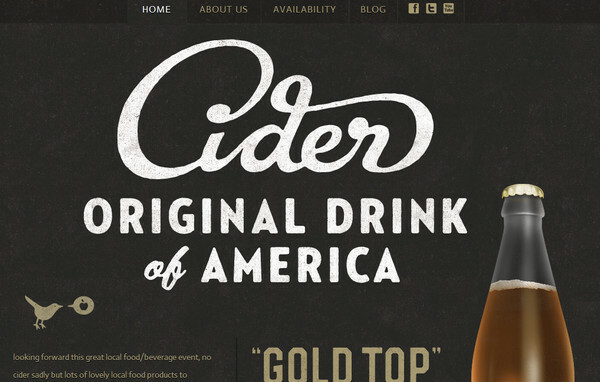 Today is a beverage-related website designs’ turn to show itself in all its glory. Such type of websites, as well as others, is rich in various creative realizations that can easily overwhelm onlookers with its elegance, neatness, and unconventional methods of showcasing products. As it is expected, beverage-related websites play a role not only of informative and familiarization source, but also of an effective platform for promotion and advertising. Almost every site welcomes its users with appealing colorfully illustrated set of merchandise that either used as a decorative element, or become a sterling participant of a whole navigation system. Designers feel free to leverage different styles such as grunge or minimalism, or simply use artistic methods such as digital scrapbooking or hand-drawn illustrations that are generally spiced up with remarkable photo manipulated backgrounds. Also, designers often turn to nature theme, incorporating various organic-inspired elements in order to make website look green and inartificial. As for informative side, it usually manifests itself in separate data widgets or text blocks, where owners throw light on history, manufacturing process or simple descriptions, accurately and unobtrusively emphasizing all the quality of goods. Taking into account all of above, we have gathered a collection that includes various wonderful examples of beverage-related website designs with stylish sophisticated look. 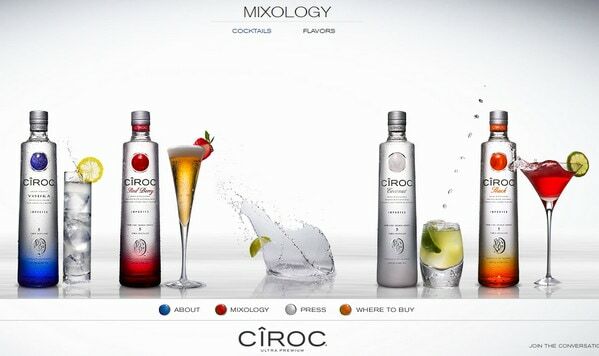 Ciroc looks elegant and refined due to clean light-grey background with accurately incorporated photo manipulation of splash water and cocktail-inspired menu. 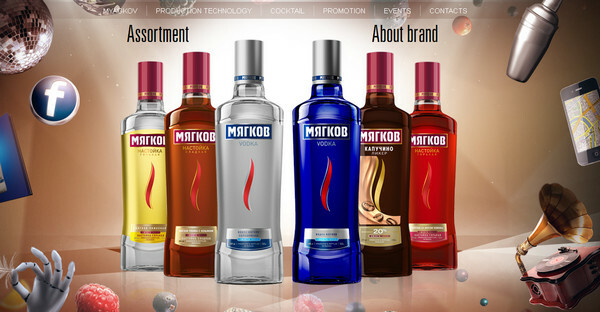 Myagkov Vodka utilizes technique of multilayerness that gives to design 3-dimensional feeling. Majority of soaring graphical elements were made with club theme in mind. Austin has strong grunge atmosphere, featuring different shabby decorations and bold slightly rough typography. 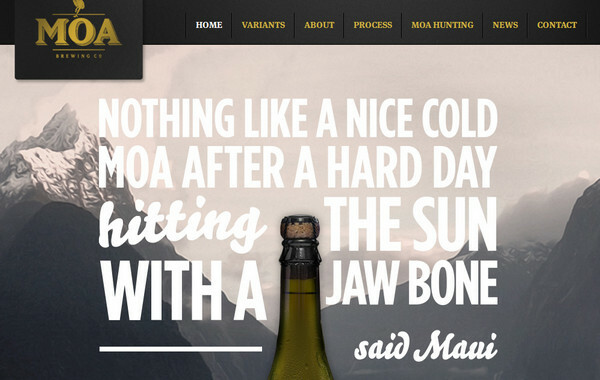 Moa Beer beautifully combines together full-screen nature photo background, massive tagline represented by means of white plain fat type, and bottle of a beer which neatly bisects welcome screen. 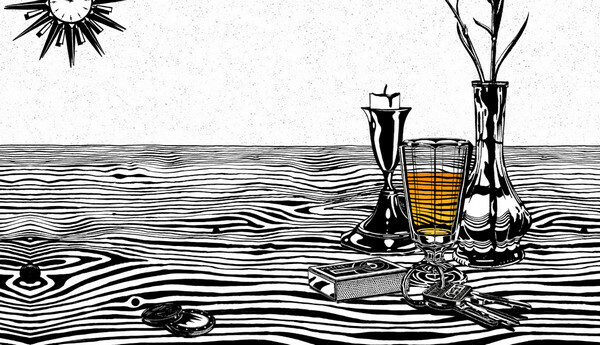 Michelberger Booze is a fully illustrated website design, primarily including black-and-white drawings that are exposed to a small animation. 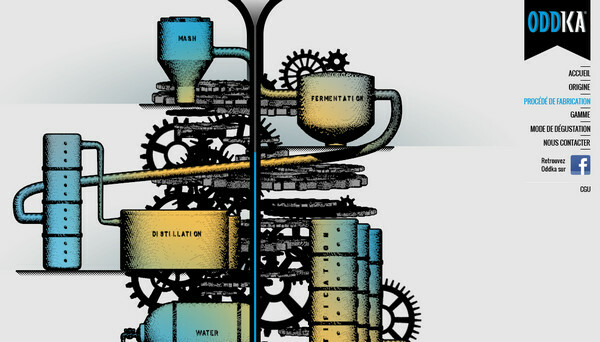 Oddka France graphically shows the process of making tipple, briefly and visually familiarizing visitors with standard of quality. 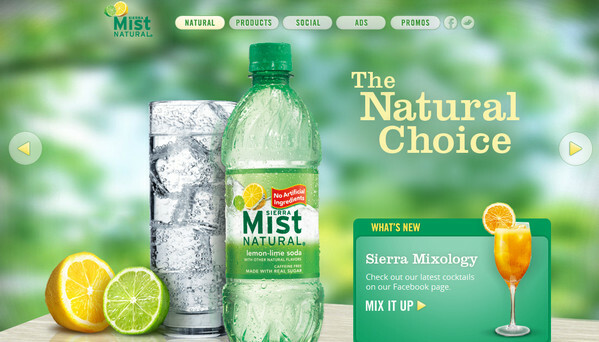 Sierra Mist Natural features huge wide-screen slider with picturesque landscape images (some of them have modern smooth blur effect that look stylish and natural) as a background and several organic elements on a fore. 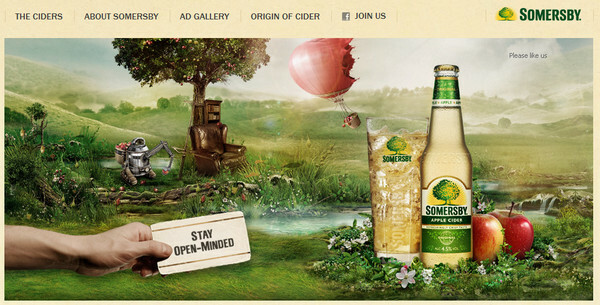 Somersby Cider has a truly natural vibe with amazing highly-detailed surreal image background that is accurately complemented by bottle of advertised cider. 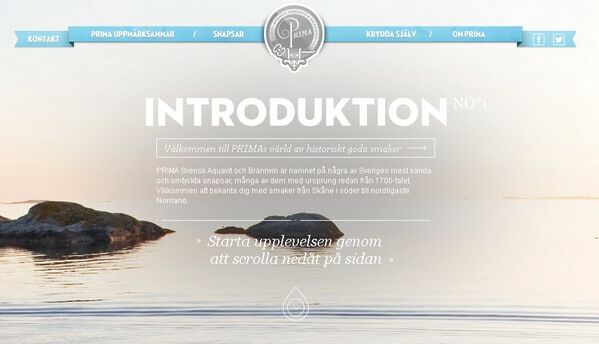 Prima exudes an image of serenity and pacification thanks to photo background that depicts tranquil water surface. 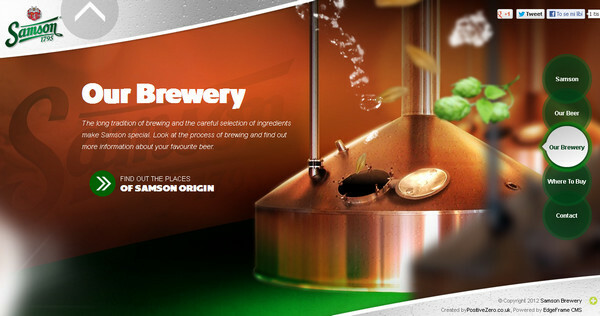 Samson utilizes set of multilayered images that features products, brewery machine and raw stuff, thereby colorfully familiarizing users with brewing process. 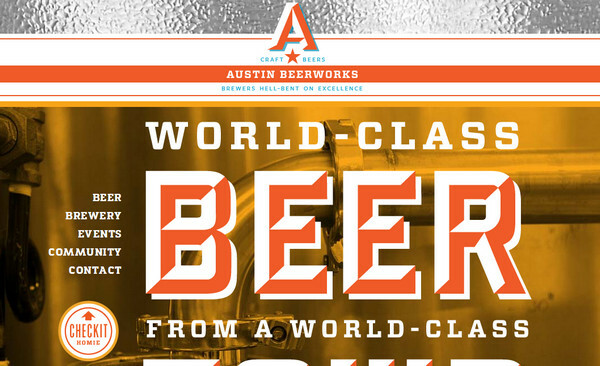 Austin Beerworks makes use of bright orange color palette that reflects in different elements. Moreover, design severely relies on huge doubled typography, shiny metal texture and beer-related photos. 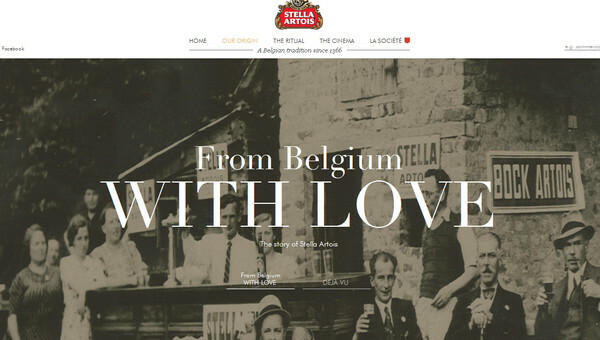 Stella Artois includes a great deal of spectacular images that shed a light on a history of a product. Miller Music Tour has bright cosmopolitan photo background with pleasant glamorous touch that breathes nightlife. 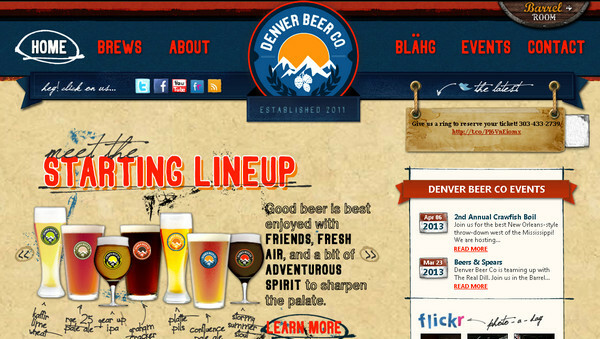 Denver Beer Co. is a heavy textured design with a numerous superimposed layers that all together resemble technique of digital collage and make site look complex and interesting. 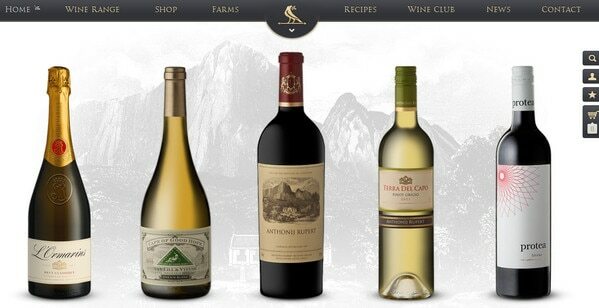 Rupert Wines keeps things clean and simple, clearly showing product line on a welcome section. 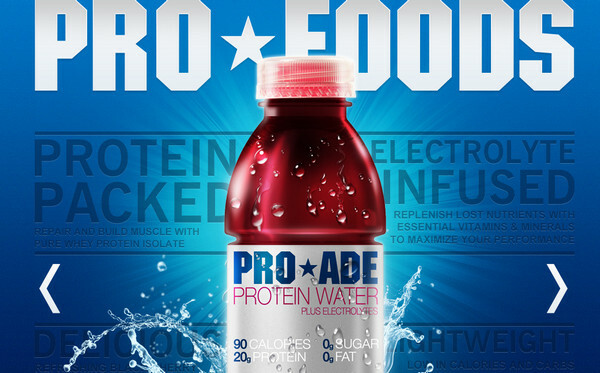 Pro Foods wonderfully illustrates main product, including it in amazing water-inspired photo manipulation that captivates users with its freshness and deep blue colors. 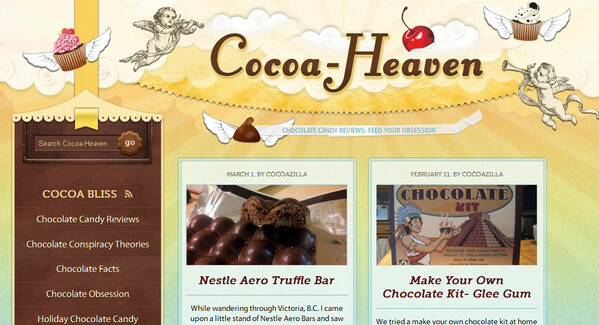 Cocoa Heaven charms users by verily artistic approach, demonstrating striking divine header and chocolate-like ornamental components. 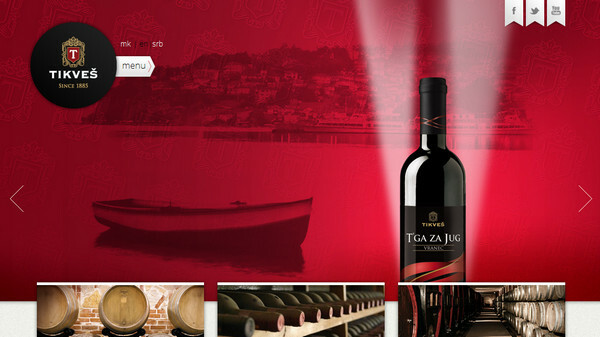 Tikves Winery uses rather minimal landing page with several informative sliders and brief history widget, revealing more detailed information by means of inner pages. 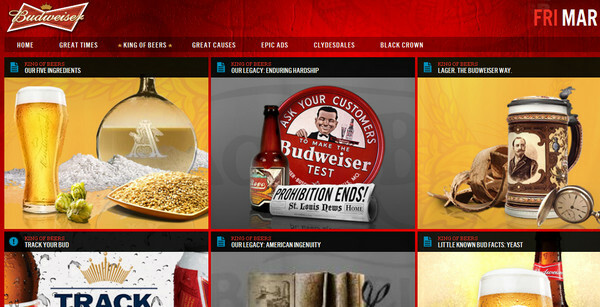 Budweiser utilizes grid in order to make website look organized and accurate, and relies on red as a main color. 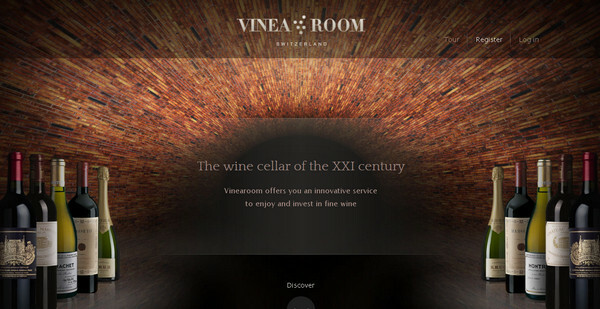 Vinea room leverages approach of vertical parallax and makes use of darken but thrilling image background, although design is scantily decorated. 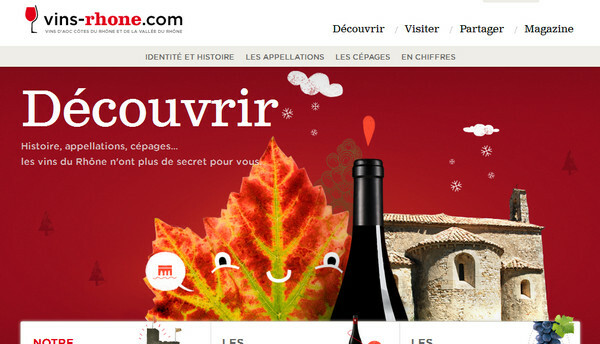 Vins Rhone is a beautiful slightly bizarre one-page website design with a wonderfully realized scrapbook style. 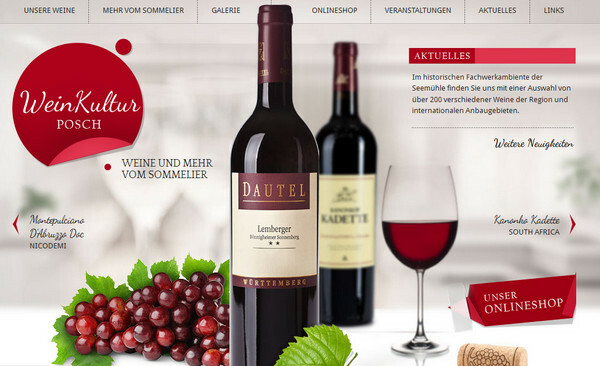 Designer uses red color that is widely loved by food-related website designs for its ability to increase an appetite. 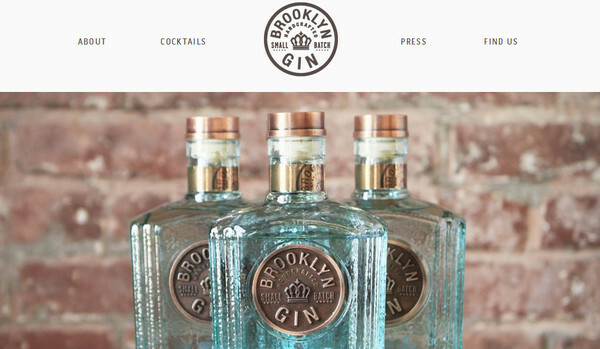 Brooklyn Gin has clean, rather plain but organized outward with a great deal of blank space which adds a note of freshness and neatness. 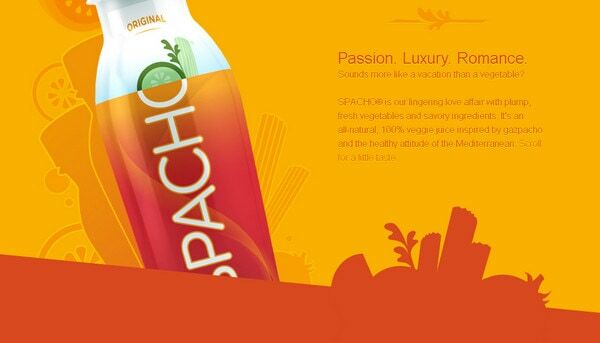 Spacho is an illustration driven design with a bunch of vector monochromatic graphics made in orange and yellow color palette. Website is based on parallax effect that gives to a website trendy feel. 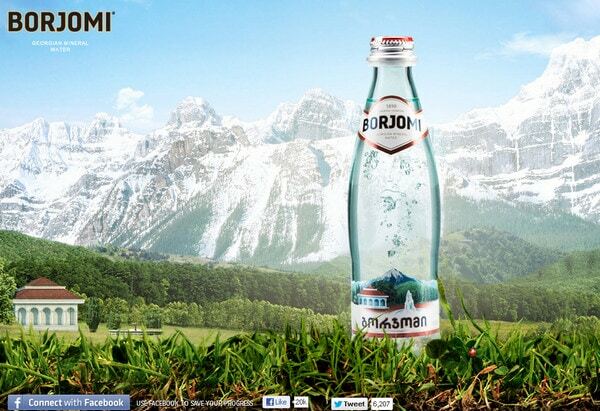 Borjomi is just simple landing page that features picturesque landscape photo background simply giving a product natural and unadulterated impression. 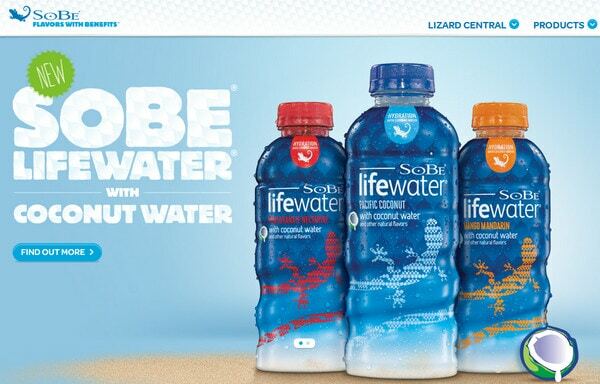 Sobe has an amazing wide-screen image slider which occupies a whole homepage and uses striking bold typography. It is fully animated website with lovely presentations for every line product. Weinhandlung posch gets the feel of a good winery from engrossing set of wine-related photos, descriptive data widgets with nice font, restrained decorations and light-grey color scheme. Majority of beverage-related websites have well-structured designs with clean and restrained outward. Beautiful combination of images and descriptions in nearly equal proportions make website look strikingly harmonious and attractive. It is evident that modern designers take into consideration not only visual aspect but also informative side of an issue, making a website fully comprehensive. Feel free to share with us your opinion using comment section. Tell us what do you think of such websites? Are they modern and stylish? Do you find them inspiring? Are they well-informed and visually appealing? It has been around for many years now, but it’s still the best I’ve ever seen.